ElectronicLocal: Better to Be Lucky than Smart? There's that sayin g. It's sometimes true as it was today. I got long in the DAX. I was a bit bored I think and realy should have waited until after Draghi's speech, but I didn't. Then I got lucky and there was a sweep: a big order, relatively, came in and took al the offers. The VI bars were green on the offer and zero lots on the bid. The market then distributed. 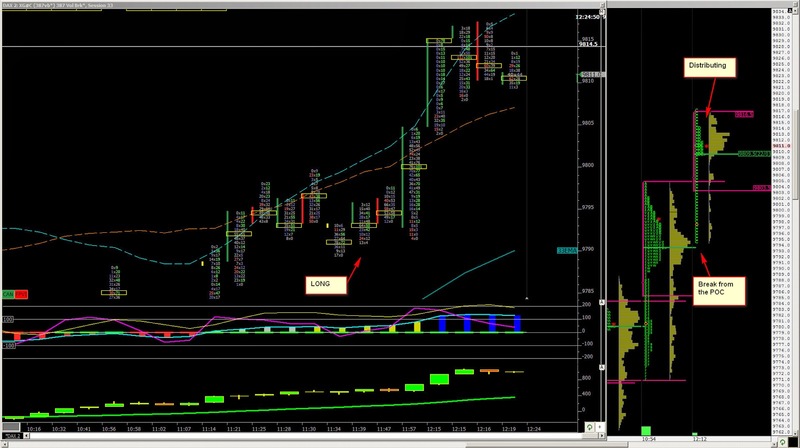 Chart below is not the chart I traded from - I was using my scalping chart of 50v. Same methods just very sensitive chart. The dynamic profile popped from the POC so the move was building. I guess that's what triggered the large order. I was luckier than smart but I guess you have to put yourself into the position to be able to be lucky.